Bruce  observed tooth loss across all ages; he found that the main reason for tooth loss was dental caries (83%) followed by periodontal disease (17%). Hoover and McDermount  found a higher incidence of edentulism in males than females whereas Marcus et al. reported that the edentulism prevalence had no relation with gender. As epidemiologic studies on edentulism and tooth loss vary considerably in prevalence between countries and between geographic regions within countries, ,, and because there are no available studies (to our knowledge) that have investigated the prevalence of partial edentulism among subjects in Aljouf region, the objective of the current study was conducted to assess the incidence of Kennedy's classification among partially edentulous individuals along with its correlation with age. This would be of valuable information to oral health planners for proposing strategies helping in the development of dental health care management in Saudi Arabia. This study was carried out from December 2015 to April 2016 among dental patients attending the Outpatient Clinics, College of Dentistry, Aljouf University, Saudi Arabia. The inclusion criteria include both genders, aged between 21 years and 50 years with partially edentulous spaces. Patients with an only missing third molar, unerupted or congenitally missing teeth, root tips, and loose teeth that were indicated for extraction were not included in the study. A total of 146 partially edentulous patients were clinically examined after obtaining written consent. Four patient were excluded after panoramic radiograph was obtained. The study has been approved by a research ethics committee at Aljouf University. Selected patients were grouped into three age groups. Patients were clinically examined intraorally by two prosthodontist in the outpatients clinic Department. Kennedy's classification  was used to determine the pattern of partially edentulous arches. Modification areas were not included in the assessment to avoid complexity. Data was analyzed using the Statistical Package for the Social Sciences version 20.0 for windows. Prevalence and pattern of partial edentulism among dental patients attending College of Dentistry, Aljouf University were studied. The mean age of the selected patients was 35.5 years. The results showed that the occurrence of Kennedy Class III partial edentulism was 67.2% in the maxillary arch and 64.1% in the mandibular arch. Followed by Class II in both the maxillary and mandibular arch with an average of 16.3% in the maxillary arch and 14.8% in the mandibular arch. Based on these results, Kennedy's Class III was the most prevalent partially edentulous pattern 65.4% among the maxillary and the mandibular arch. 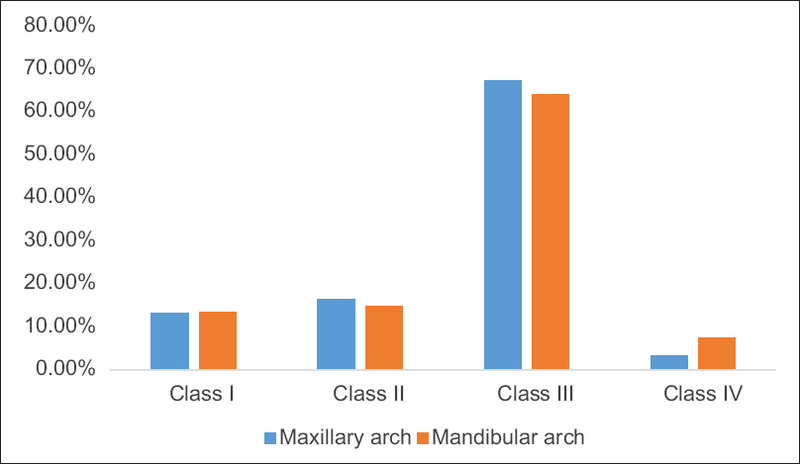 [Table 1] and [Figure 1] show the incidence of different patterns according to Kennedy's classification for the maxillary arch and mandibular arch. Distribution of different classes in the age groups is shown in [Table 2] and [Figure 2]. The results reveal that class III has the highest prevalence in group II (31-40 years) and group I (21-30 years) patients. With increasing age, a transition of bounded saddles into free end saddles was found. 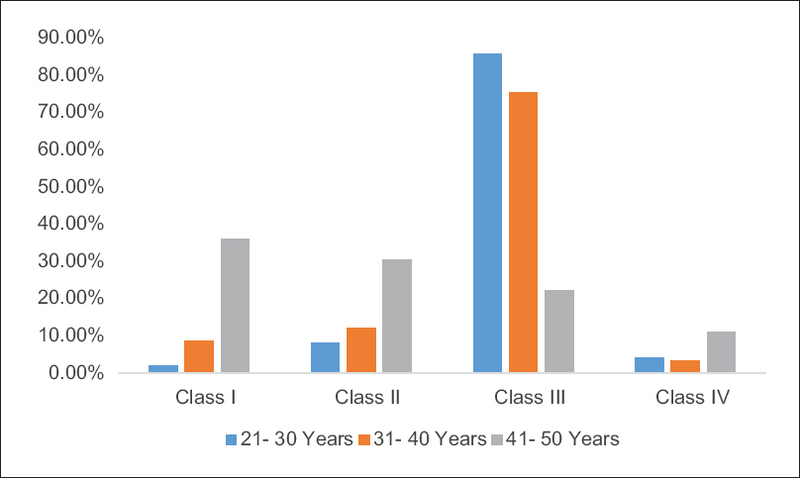 Classes I and II have the highest incidence among group III patients (41-50 years), as shown in [Figure 3]. Table 2: The age-wise distribution of the various Kennedy's classes. Kennedy Class III was reported to be the most common pattern (57.14%) in a sample of the Iraqi population in a study carried out by Hatim et al. In Benin, Ehikhamenor, et al. found that the most commonly restored edentulous area was Kennedy's class III (57.3%). In this study Kennedy's Class III was found to be the most prevalent pattern of partial edentulism both in the maxillary arch (67.2%) and the mandibular arch (64.1%). The present study was in accordance to the study of Madhankumar  and partially in accordance with Curtis et al. who found that the Kennedy's Class III was only common in the maxillary arches, whereas in the mandibular arches, Kennedy's Class I was the most dominant pattern. This variation may be due to difference in the mean of patients' age as the mean age in Curtis' study was 55 years, whereas in the current study, the mean age of the patients was 35.5 years. The limitation of the present study includes small, nonprobability sample of convenience. The size and homogeneity of the sample limit this study, and hence additional studies are recommended. 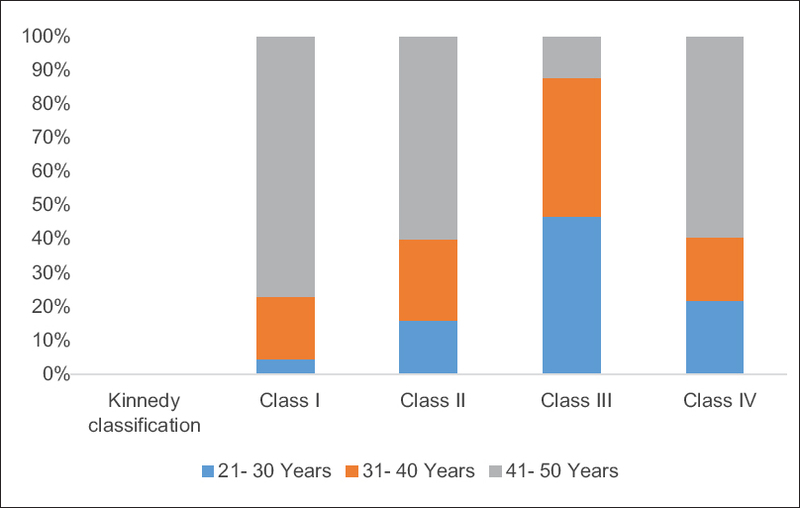 The present study showed that, among dental patients attending outpatient clinics, College of Dentistry, Aljouf University, there is an increase in Classes I and II Kennedy classification and a decrease in Classes III and IV with an increase in age, The prevalence of Class III was predominant among younger population of 21-30 year and 31-40 years, whereas in group III between 41 and 50 years Class I was predominant. It can be stated that the need for prosthodontics care is expected to increase with age, and hence, more efforts should be made for improving dental education and motivation among patients in Aljouf region. Further evaluation of long-term dental care outcomes and analysis of the type of prostheses required may clarify more information about partially edentulous patients. Madhankumar S, Mohamed K, Natarajan S, Kumar VA, Athiban I, Padmanabhan TV. Prevalence of partial edentulousness among the patients reporting to the Department of Prosthodontics Sri Ramachandra University Chennai, India: An epidemiological study. J Pharm Bioallied Sci 2015;7(Suppl 2):S643-7. Vadavadagi SV, Srinivasa H, Goutham GB, Hajira N, Lahari M, Reddy GT. Partial Edentulism and its Association with Socio-Demographic Variables among Subjects Attending Dental Teaching Institutions, India. J Int Oral Health 2015;7(Suppl 2):60-3. Mayunga GM, Lutula PS, Sekele IB, Bolenge I, Kumpanya N, Nyengele K. Impact of the edentulousness on the quality of life related to the oral health of the Congolese. Odontostomatol Trop 2015;38:31-6. Bruce, Nyako E, Adobo J. Dental service utilization at the Korle Bu Teaching Hospital. Afr Oral Hlth Sci J 2001;2:4. Eustaquio-Raga MV, Montiel-Company JM, Almerich-Silla JM. Factors associated with edentulousness in an elderly population in Valencia (Spain). Gac Sanit 2013;27:123-7. Bertossi D, Rossetto A, Piubelli C, Rossini N, Zanotti G, Rodella LF, et al. Evaluation of quality of life in patients with total or partial edentulism treated with computer-assisted implantology. Minerva Stomatol 2013; [Epub ahead of print]. Dolan TA, Gilbert GH, Duncan RP, Foerster U. Risk indicators of edentulism, partial tooth loss and prosthetic status among black and white middle-aged and older adults. Community Dent Oral Epidemiol 2001;29:329-40. Curtis DA, Curtis TA, Wagnild GW, Finzen FC. Incidence of various classes of removable partial dentures. J Prosthet Dent 1992;67:664-7. Abdurahiman VT, Abdul Khader M, Sanju John J. Frequency of partial edentulism and awareness to restore the same: A cross sectional study in the age group of 18-25 years among kerala student population. J Indian Prosthodont Soc 2013;13:461-5. Sunnegardh-Gronberg K, Davidson T, Gynther G, Jemt T, Lekholm U, Nilner K, et al. Treatment of adult patients with partial edentulism: A systematic review. Int J Prosthodont 2012;25:568-81. Bharathi M, Babu KR, Reddy G, Gupta N, Misuriya A, Vinod V. Partial Edentulism based on Kennedy's classification: An epidemiological study. J Contemp Dent Pract 2014;15:229-31. Basnyat KC, Sapkota B, Shrestha S. Epidemiological Survey on Edentulousness in Elderly Nepalese Population. Kathmandu Univ Med J 2014;12:259-63. Jeyapalan V, Krishnan CS. Partial Edentulism and its Correlation to Age, Gender, Socio-economic Status and Incidence of Various Kennedy's Classes- A Literature Review. J Clin Diagn Res 2015;9:ZE14-7. Medina-Solis CE, Pontigo-Loyola AP, Perez-Campos E, Hernandez-Cruz P, Avila-Burgos L, Kowolik MJ, et al. Association between edentulism and angina pectoris in Mexican adults aged 35 years and older: A multivariate analysis of a population-based survey. J Periodontol 2014;85:406-16. Al Hamdan E, Fahmy MM. Socioeconomic factors and complete edentulism for female patients at King Saud University, Riyadh, Saudi Arabia. Tanta Dent J 2014;11:169-73. Hoover JN, McDermott RE. Edentulousness in patients attending a university dental clinic. J Can Dent Assoc 1989;55:139-40. Marcus PA, Joshi A, Jones JA, Morgano SM. Complete edentulism and denture use for elders in New England. J Prosthet Dent 1996;76:260-6. El-Meligy O, Maashi M, Al-Mushayt A, Al-Nowaiser A, Al-Mubark S. The Effect of Full-Mouth Rehabilitation on Oral Health-Related Quality of Life for Children with Special Health Care Needs. J Clin Pediatr Dent 2016;40:53-61. Meskin L, Brown J. Prevalence and patterns of tooth loss in U.S. adult and senior populations. Int J Oral Implantol 1988;5:59-60. Pun DK, Waliszewski MP, Waliszewski KJ, Berzins D. Survey of partial removable dental prosthesis (partial RDP) types in a distinct patient population. J Prosthet Dent 2011;106:48-56. Sheiham A, Hobdell MH, Cowell CR. Patterns of tooth loss in British populations. Studies on industrial populations. Br Dent J 1969;126:255-60. Haikola B, Oikarinen K, Soderholm AL, Remes-Lyly T, Sipila K. Prevalence of edentulousness and related factors among elderly Finns. J Oral Rehabil 2008;35:827-35. Ulmer FC, Jr. Kennedy-Applegate classification of partially edentulous dental arches. NADL J 1983;30:37-40. Hatim NA, Muhammed SA, Hasan NH. Psychological profile of patient with missing teeth and refuses treatment. Al-Rafidain Dent J 2003;3:5. Ehikhamenor H, Oboro O, Onuora OI, Umanah AU, Chukwumah NM, Aivboraye IA. Types of removable prostheses requested by patients who were presented to the University of Benin Teaching Hospital Dental Clinic. J Dent Oral Hyg 2010;2:4.